Hello! It’s me. I don’t know why it’s such a surprise but the weather has been so strange for the past month. August was brutal with insane heat. September is starting off crazy too. 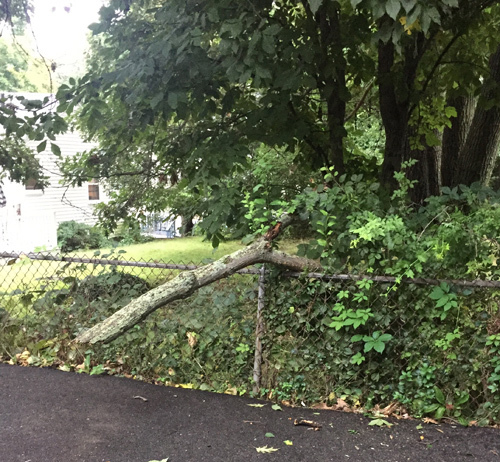 Two days ago, I hoped in the car to bring my oldest son to school and when I was backing up (thank goodness for rear cameras), I noticed this rather large tree limb had landed on the fence and I was about to back into it. I am usually rather good about looking around at the trees in my yard (nature geek) whenever I go outside but that morning we were running late and I still had to go and get back to take my younger son to school. I also didn’t hear any crashing of limbs the night prior only heavy rain and wind. I have been watching the news to see how North Carolina fares in their upcoming storm. I pray no one is hurt and that minor damage occurs. It’s incredibly stressful to see how fast our weather has gone to such extremes. We experience really high wind storms more than I remember while growing up. I have a lot of trees on and around our property and it makes me nervous when we have high winds. I really love Fall and can’t wait for it’s arrival. It’s one of my favorite seasons and I hope we don’t skip it and go straight to winter. But only time will tell. Well, I am going to get back to work. I was just taking a break and started thinking about it so I thought I would share.